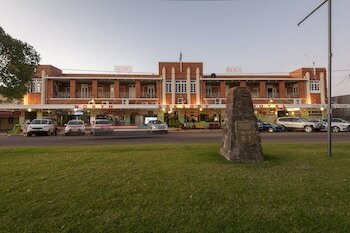 With a stay at North Gregory Hotel in Winton, you'll be a 3-minute walk from Waltzing Matilda Centre and 12 minutes by foot from Winton Golf Course. Featured amenities include luggage storage, laundry facilities, and an elevator (lift). Free self parking is available onsite. When you stay at Amamoor Homestead B&B and Country Cottages in Amamoor, you'll be 13 minutes by car from Shiann Alpacas. Located in Kalbarri, Kalbarri Reef Villas is within a 15-minute walk of Kalbarri Visitor Centre and Chinaman's Beach. Free self parking is available onsite.